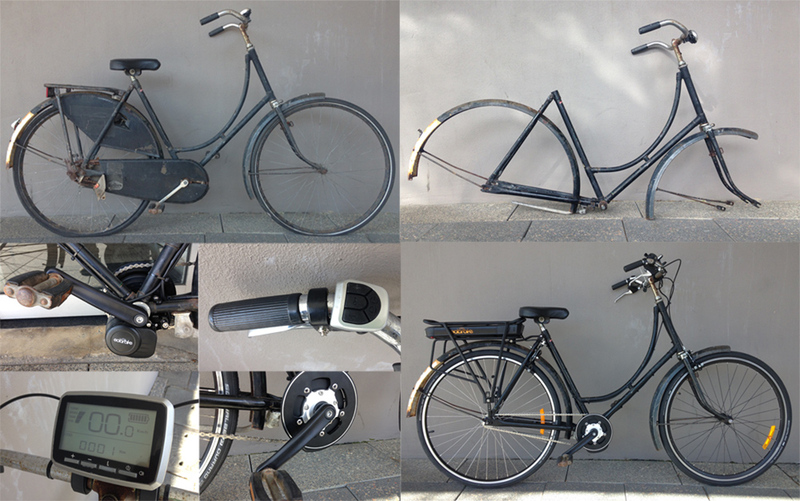 1950s Electric Dutch bike conversion. This was an old 1950s Dutch style single speed bicycle that came into the shop a little while ago with lots of rust, mud and spiders. We proceeded to electrify this lovely old bicycle as requested. There were a few small issues to get it electric. The first one was the decision on where to locate the motor. The front forks were not suitable for a hub motor due to their thinness and angle. The rear axle also wasn’t suitable for a hub motor as it was a single speed bike so the distance across the axle was only 120mm. It wouldn’t have been ideal to stretch it to the 130-132mm needed for a typical rear hub motor. The final option left to us was to use a mid-drive motor. We have been using our own designed neat little mid-drive motor (click here for details) a lot lately. It’s smaller than all other available kits and it has lovely torque sensing. It performs rather similarly to the BOSCH or SHIMANO mid-drive motors but with a few small benefits. The difference between a torque sensing kit and a cadence sensing conversion kit is that with torque sensing the motor responds to the pressure you apply to the pedals, with cadence sensing the motor responds to the revolutions of the pedals. The torque sensing kits are typically a little smoother in regard to performance but an added advantage is that you do not require a throttle to operate them. Whilst with a cadence sensing kit, the throttle is not an absolute necessity, the times you can get in trouble without the throttle is when you need to start up a hill. Because you need to rotate the pedals approximately half a turn to get the motor to engage it can be difficult to begin riding. The throttle is very useful just to give you that initial kick and then you don’t need it once you are up and riding and rotating the pedals. The torque kits are good in that the response is immediate as soon as you start pushing. The throttle is also available on our torque sensing kits and it is also rather useful in certain times when you want a little more immediate power – such as crossing busy roads or negotiating lots of pedestrians. The final hurdle was finding a rear brake. The original system had a rear coaster brake – that’s one where you pedal backwards to activate the brake like on your childhood BMX. Because the motorised crank drive system does not engage in reverse then this braking system was lost. We ended up searching far and wide to find a long reach rear brake caliper (99mm) that we could fit to this bike. In the end, the bike came together rather well. It is an extremely comfortable ride and it was lovely to put some life back into this 1950s classic. It will surely see a lot more kilometres now it’s electric! « Special of the week. Electric AVANTI Discovery 2.